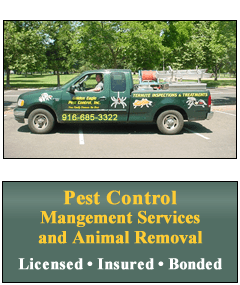 We are an owner and operated pest control company located in Elk Grove, California, providing pest control and animal removal throughout Sacramento and Yolo, Solano, Sonoma, San Joaquin, El Dorado, and Marin counties. We have many years of experience and are educated in Entomology, so we have studied bugs and know the proper way to get rid of them and keep them out. Tim Russell, Owner/Operator for the past 18 years has taken the time to educate himself about the pests that drive you crazy. After receiving his operator's license, he went on to get a degree in Entomology. He has over 20 years of experience in the industry with over 100,000 applications done safely. His education and experience have helped him in determining the most effective treatment for all your pest needs. Much of Golden Eagle's business is generated from word of mouth by very satisfied customers. Customer Satisfaction is a goal Tim aims to achieve. He is patient, takes the time to educate his clients, he is very attentive to his client's needs as well as all details of his work. He is devoted to keeping you safe and pest free.